Since my last astrophotography post got some good feedback, I figured I'd post a few more here. 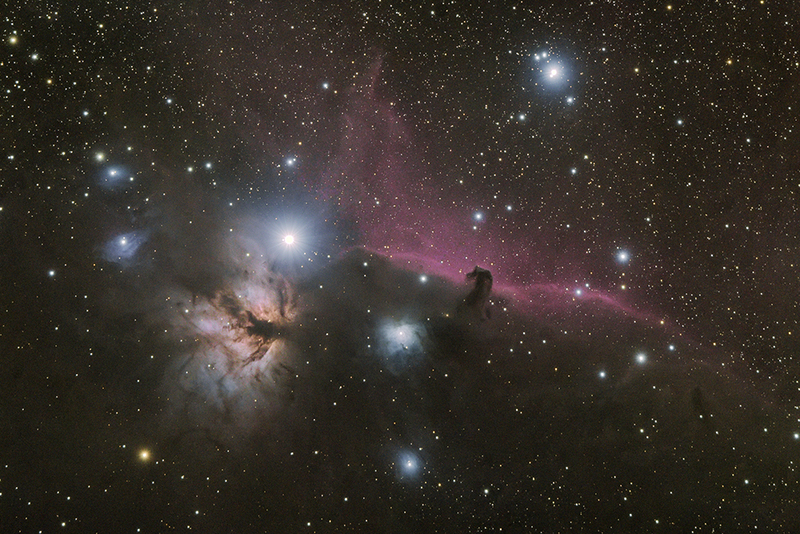 This is an image of the Horsehead Nebula and Flame Nebula. This was shot on a not very nice night, a couple days after Christmas. There was quite a few clouds out that night, so I had to shoot between the clouds to get anything done. I HAD to try out my new Guiding camera and scope I got for Christmas though, so it was worth it. I took a total of 120 minutes of pictures (30 subs at 240 seconds each). I could have had a nicer final photo with more detail, but the clouds weren't cooperating. As a note, many astrophotographers don't even start editing their image until they have 4-5 hours (at least) of photos to stack. I am happy with what I got though, especially considering the clouds, the light pollution I shoot through (in my backyard in Bortle 7 skies), and with an unmodified DSLR and not a astro camera. Superb indeed! I hope to see many more of your fine astrophotography. Congratulations! I am amazed at the quality of your pictures specifically more o when you're using an unmodified dSLR! Are you using any of those 14nm filters for highly light polluted areas? I am curious about what was the external temperature at the time of shooting? Since most of the problems in deep space astrophotography, aside form the IR cutoff filter, are caused by sensor overheating.